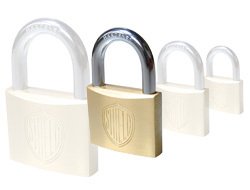 Shield is the latest brand of padlock in the market offering great quality but at an even better price. They have ensured all their locks use a hardened steel shackle, quality brass body and a decent anti-pick mechanism. They are also double bolted to resist pulling on the sizes 30, 40 and 50mm. One important consideration is the number of differs. Although these Shield locks do have a good number of differs to be very secure in the open market, they might not be high enough for some schools when many are placed in a single setting. The 30mm carries about 75 differs and the 40 about 200 differs. This is usually fine but you must bare this in mind when choosing a lock for lockers in a school. If in doubt and if you have potentially troublesome students, then opt for an ABUS padlock which will have over 250 differs in a single set. All our padlocks are delivered with 2 keys each inclusive of the price. If you require more than two keys then please order the keyed alike variant of this lock and then you can order extra keys by clicking here.We only offer additional keys on the keyed alike locks since they are not pre-packaged and it enables us to key more. 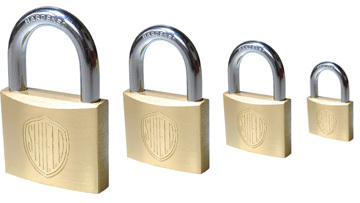 On our website offer four sizes of standard brass padlock. 20mm, 30mm, 40mm and 50mm. Please select your desired size from the drop down menu above. Each is of the same design and dimensions but have increased security with size. 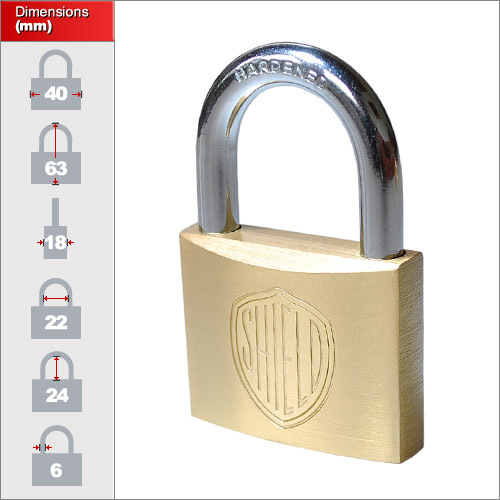 Your choice of padlock size depends on the application but you can click the image above for specific measurement.